Chickpeas Sundal Recipe | Channa Sundal Recipe ~ Full Scoops - A food blog with easy,simple & tasty recipes! This is the most favorite and healthy snack in our house. High in protein and low in fat, this is a wonderful snack. All sundals make very good snacks for evening or even for school and this is easy to make and tastes delicious! 1. 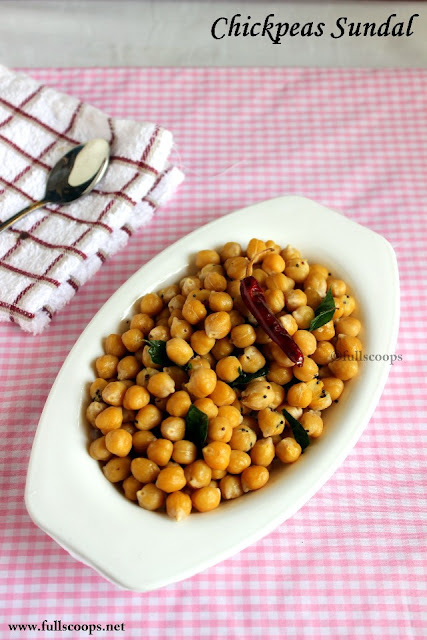 Soak the chickpeas overnight. 2. 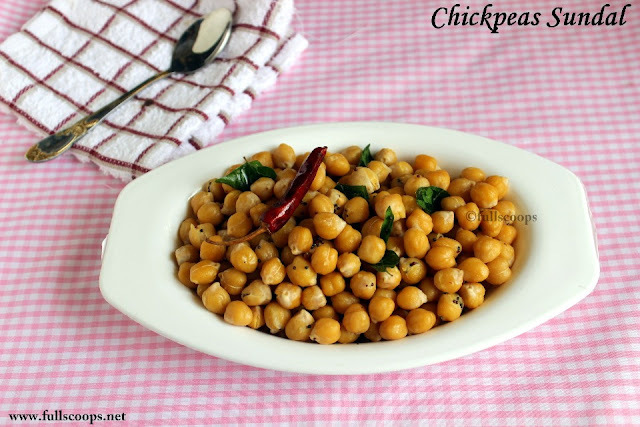 Pressure cook these soaked chickpeas with enough water and a pinch of salt until soft. I usually leave for about 3-4 whistles. 3. The chickpeas should be cooked soft. Drain the water and set aside. 4. In a pan, add oil. When the oil heats up, add mustard seeds and allow to splutter. 5. Add urad dal and curry leaves, hing and red chilli. 6. Add the pressure cooked chickpeas. Add the turmeric powder (if adding) and salt. Check for salt and add since we already added while pressure cooking the peas. 7. Mix well and serve. 1. You can add grated coconut to this. 2. Do not discard the water from the cooked chickpeas. Either add the chickpeas to the pan along with the remaining water and saute until the water is absorbed or use the water to knead dough for rotis. 3. 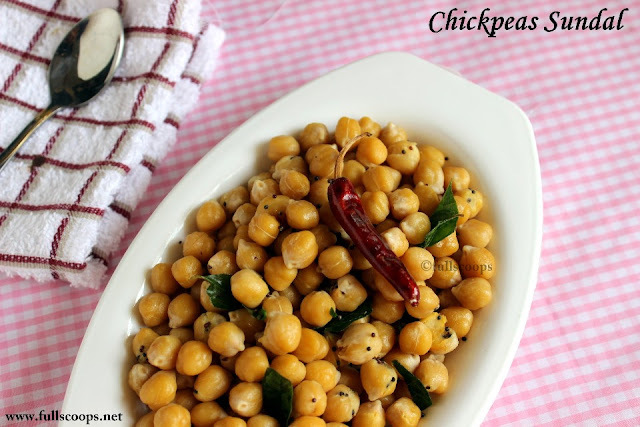 Pressure the soaked chickpeas with just enough water, do not add too much so that you will not have a lot of water left over once it's cooked. 4. Adding turmeric powder is optional. I did not add.